Be the first to share your favorite memory, photo or story of Kinsley. This memorial page is dedicated for family, friends and future generations to celebrate the life of their loved one. Funeral services to celebrate the life Miss Kinsley Denise Williams, age 1, will be held at 11:00 o’clock a.m., Wednesday , January 23, 2019, in the chapel of Baker Funeral Home. Preacher Cotton Pate will officiate. Burial will follow in the Kershaw City Cemetery. Kinsley passed away, Friday, January 18, at her home. Born in Pineville, NC, she was the daughter of Josh Lee Williams and Jerrica Hope Veal. Surviving in addition to her parents are her maternal grandparents, David and Patricia Veal; her paternal grandfather, John Williams; her maternal great grandmothers, Ann Veal and Vickie Catoe; her paternal great grandfather, Daniel Boone and numerous, aunts, uncles and cousins. She was preceded in death by her paternal grandmother, Denise Williams; her maternal great grandfathers, James Veal and Jerry Catoe; her paternal great grandparents, James and Pauline Williams and her paternal great grandmother, Mary Boone. 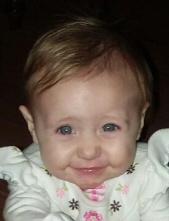 Memorial contributions in memory of Kinsley may be made to the charity of one’s choice. The family will receive friends, Wednesday, January 23, prior to the service from 10:00 to 11:00 o’clock a.m. at the funeral home. Baker Funeral Home is serving the Williams family. To plant a tree in memory of Kinsley Denise Williams, please visit our Tribute Store. "Email Address" would like to share the life celebration of Kinsley Denise Williams. Click on the "link" to go to share a favorite memory or leave a condolence message for the family.